The goal of the builder is to separate the way the object is created from its representation. So the process of creating an object is divided into several parts. First, I will show an example of a builder pattern on the basis of Fluent Interface, then a classic builder. The Fluent Interface builder should implement when the constructor has more than four or five parameters, we create a builder class, inside this class, which has this constructor with these many parameters. Examples in which Fluent Interface Builder would be applicable are everywhere where we have constructors that take many parameters, and Classic Builder, for example in software that accepts any input data, converting it and based on input data, creates output data, i.e. in some game where, under the influence of the user’s actions, the game performs specific events, the builder will be here the code that creates specific events in the game depending on the user’s choices. As you can see, we have separated the saving of customer data from the rest of the logic, and we can control to a greater extent how the object is created. 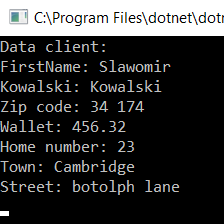 Now you can see what data is saved to the object. This is the Builder Fluent Interface, now we’ll do the example of a classic builder. 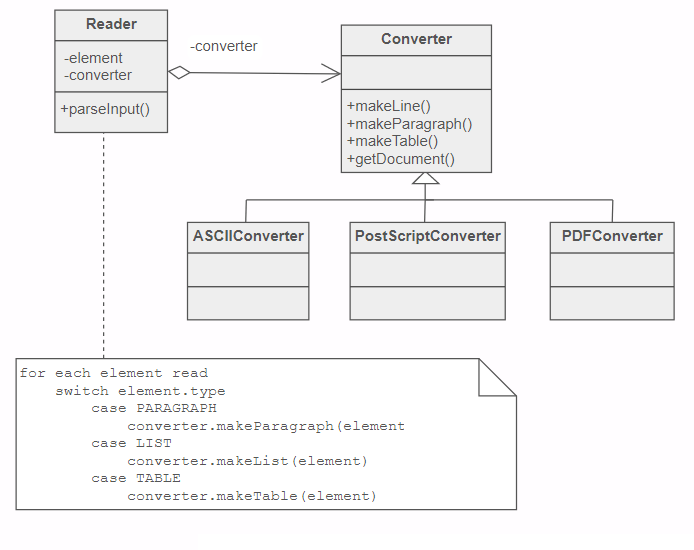 Converter class as you can see, creates instances of individual classes that read different data formats, and here the Reader class is a client who only reads these formats. First, the customer orders a meal, then the report comes to the manager, who then tells the employees who later execute the order together with the delivery to the house. 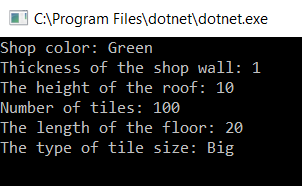 In the code, we will make an example of our store. Let’s build our store, let’s separate its objects, eg in this way walls, roof, floor, what will it look like in a classic builder? An example may start a fright at the beginning, but it’s really a simple pattern, you just have to convert it into practice. I will translate pieces of the whole code one by one, I will give the whole example at the end of the lesson in the source files, because it is long. The classic builder can be treated as a plan. We add to the Shop class, roof, floor, and wall, then create a store object with the manager in the client, in our case in the Main function, the whole is designed so that the customer can’t see how the store is created, client is commissioning the build shop the builder so relating to our example, Director class, and the client does not care how the store is built, only the finished product is delivered to him. We set in methods the BigShopTesco class parameters sets its elements and write them to the interfaces of the Shop class. To the constructor of the ShopDirector class we pass the object of the class that we want to create, that is BigShopTesco and we call its methods. 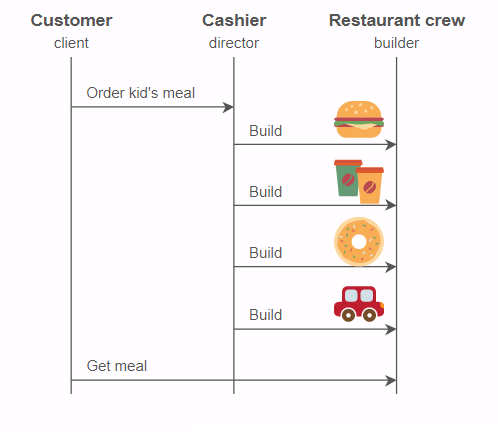 As you can see, the customer does not see how the store is built, and so it should be him does not care about it, he just orders the manager. At the end of the lesson I will give the source code to this builder. Remember, nonsense is just a read, to understand it is best to create your own builder, you can help yourself that what I did to make my own builder. You will not understand it without practice. In both cases you should use Builder wisely, because when we have a lot of these builders, the code becomes unreadable. Large diversity of class interiors. Builder is often used with the Bridge pattern, Director is an interface and the builder is in the implementation role. The builder is used with the Composite pattern to create a tree. Often, the Builder’s implementation is combined with an Abstract factory to maintain flexibility and not create concrete types of classes. This long lesson came out, but it’s probably good because the builder was hopefully well explained. In the next article, we will talk about the Abstract Factory pattern. As a standard, I remind you about the newsletter, which I send notifications about new entries and additional information about the IT world in general. Ask, comment underneath at the end of the post, share it, rate it, whatever you want.